FINALLY! The moment we've all been waiting for! On Thursday, April 17th at approximately 9:30pm, we reached 100% of our financial support goal! Praise the Lord with us for His provision of our needs! That 100% number is actually the minimum amount required to meet our basic needs of salary, ministry expenses, taxes, health insurance, etc. This summer we will continue to raise financial support beyond that initial amount so that we can be more effective as a ministry, and so we can be financially stable in the future in the event that some of our current supporters may be unable to continue giving. We want to thank all of you who have given or who have prayed alongside us for God's provision. Your faithful financial support and continued prayers is what makes this ministry possible. 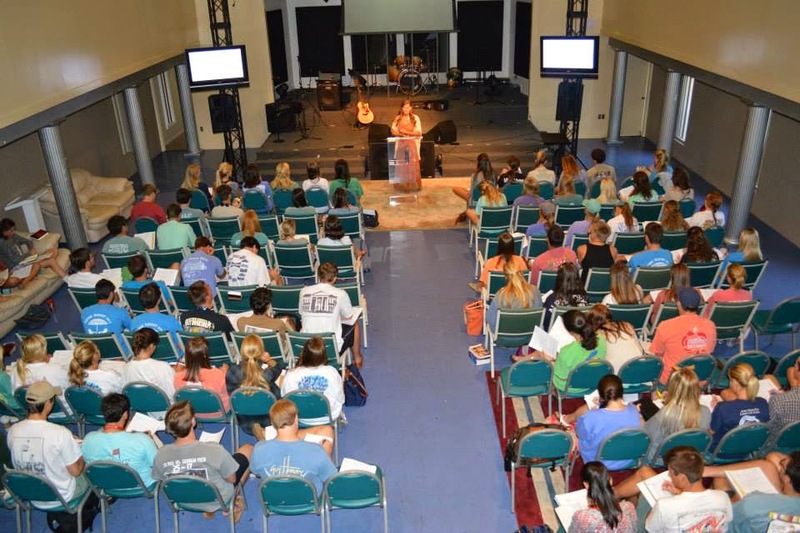 And God is doing EXCITING things in USC’s Greek Village! 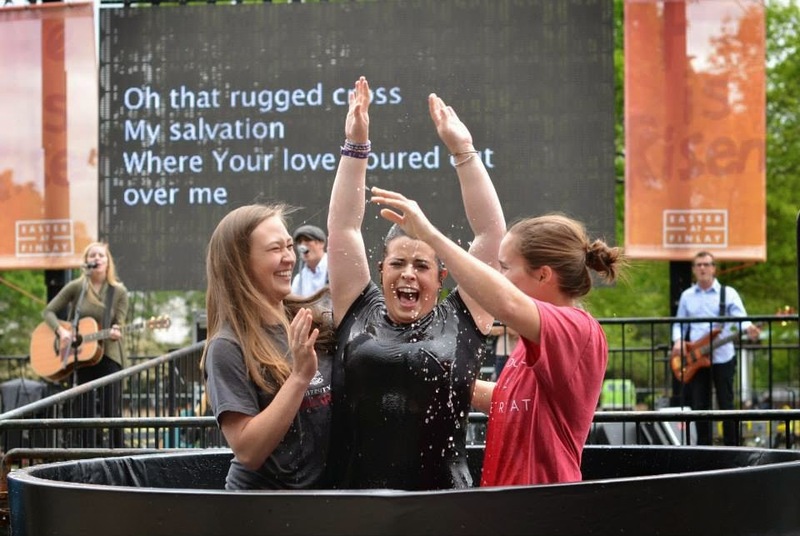 Our church, Midtown Fellowship, celebrated Easter Sunday by baptizing 22 people who have given their lives to Christ! Our baptism service is truly a celebration! 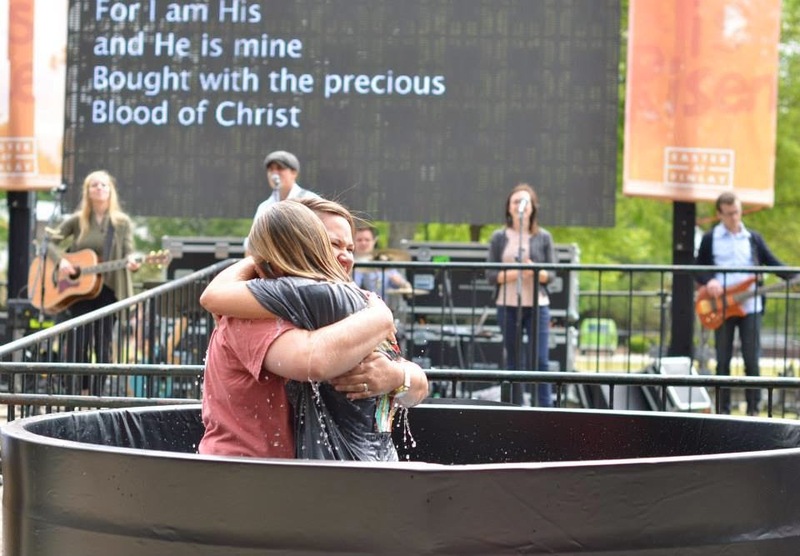 The day was extra special because we got to witness two of our student leader’s, Katy and Brooks, share their stories of redemption and get baptized! 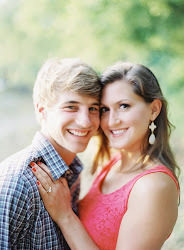 Katy is a member of Kappa Kappa Gamma and Brooks is a member of Tri Delta, both came to know Jesus through attending their sorority’s Bible study. Praise the Lord for their boldness in proclaiming their faith to their friends and family through baptism! Brooks (Tri Delt) being baptized by our Greek Impact coworker, Shelley! So, What now?! You may be wondering, what we are up to now that we are done raising our initial support? USC’s last day of classes is April 28th and exams begin the first week of May, so there is not much work to be done on campus. However, we are staying plenty busy- continuing to meet with potential supporters and finishing up our online seminary course, New Testament Survey. This past week we also got to participate in some Cru/Greek Impact staff team evaluation and planning! It was great to be with fellow staff members and hear more about what God has done on campus this past year and plan how we get to be a part of it next semester! Summer Plans…. The “summer project” we have been assigned to this year is Greek Summit! 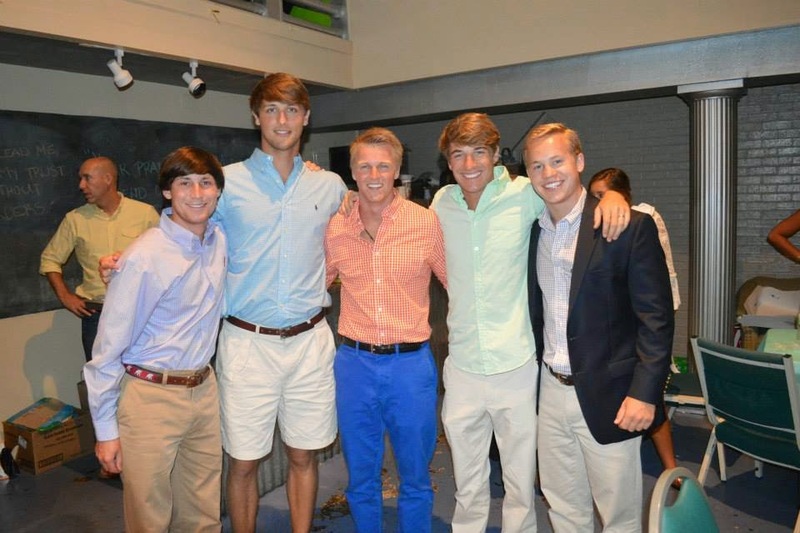 Greek Summit is a 3 week long project specifically for sorority and fraternity students across the Southeast. 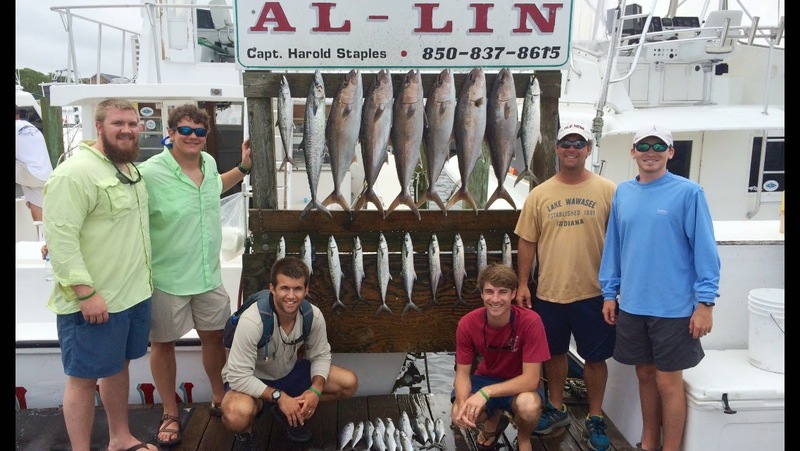 The focus of the project is to teach students how to grow in their faith and to equip them to share their faith with their sorority sisters and fraternity brothers. After we return from Greek Summit, we will be working to build relationships with the students that are remaining in Columbia for the summer. We will lead and host a summer Bible study in our house, which will be a great opportunity to grow in our relationships. We are excited to dive into ministry this summer! 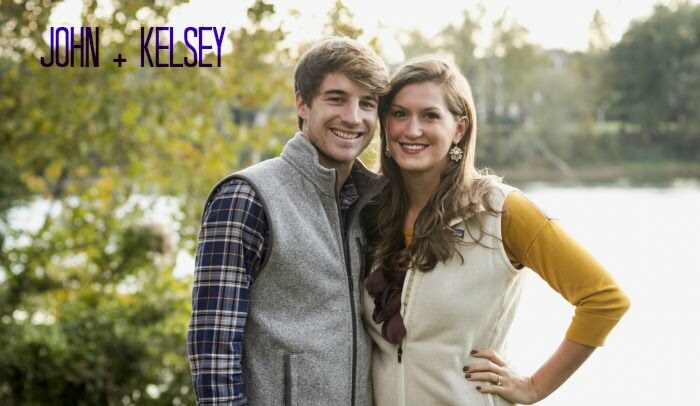 Kelsey has dealt with back pain and sciatic nerve pain from ruptured discs since her sophomore year of high school. After many failed attempts to heal the discs naturally and avoid surgery, she had a lumbar discectomy in May of 2011. By God’s grace, the surgery worked and has allowed her to be virtually pain free for the last 3 years. Unfortunately, within the last month the same pain she used to experience has returned. UPDATE: Today we met with the neurosurgeon who did her surgery, Dr. Rambo at Columbia Neurosurgical. He said it seems that L4 disc is protruding on the sciatic nerve again or possibly scar tissue from the previous surgery. He prescribed her steroids and an anti inflammatory specifically for nerve pain. We are hoping this causes the swelling to go down and thus the pain to decrease. If after 3 weeks there is no improvement, we will schedule an MRI and go from there. PRAY for Kelsey to trust that God is good and that He cares about her pain. PRAY for God to heal the discs in Kelsey’s back and any nerve damage it may have caused, and whether He heals miraculously or heals through medicine, that He would get the glory. Whenever I need to be reminded of God's love and faithfulness, I think back to "The Mattress Story". 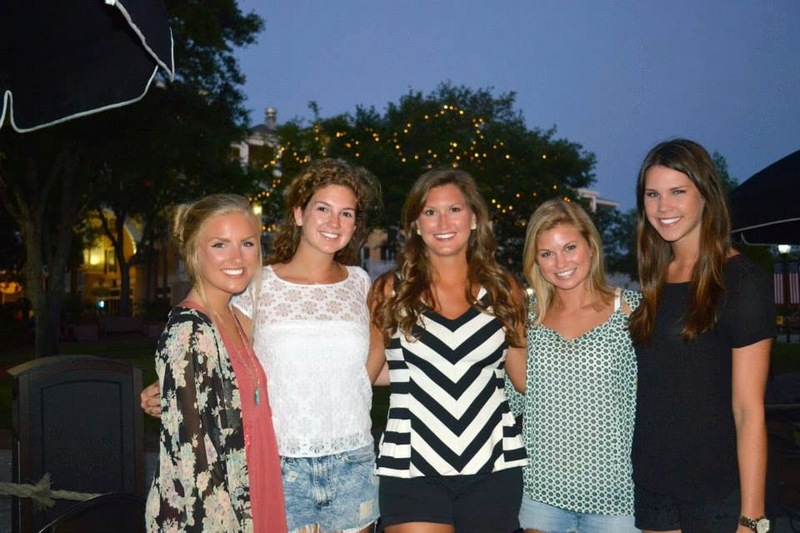 Three years ago, I spent my summer interning with Redeemed Girl Ministries in Houston, Texas. My fellow intern, Rebecca, and I, lived with an incredible woman, Kristen, who generously offered for us to stay in her two extra rooms. One room, was a fully furnished guest room, and the other had served as a storage room before it had been emptied of it's furniture to make room for our stay. The plan was after Rebecca's internship, she was going to be hired on as full time staff with Redeemed Girl and continue living with Kristen. Since Rebecca would be living with Kristen for at least the next 6 months and I was only going to be there for 8 weeks, I figured I would give Rebecca the fully furnished room and take the empty room. No big deal. Well. When I opened the door to my room and realized that there was only a cot with a foam mattress on top, I immediately regretted my decision. You see, I had just had major back surgery, a lumbar discectomy, a few weeks before arriving in Houston and I was concerned that sleeping on a foam mattress might not go so well. I know, I should have just asked Rebecca to switch with me, I'm sure she would have given up her bed immediately, but my pride got in the way. Instead, I didn't say a word and decided I would just tough it out. I chastised myself for being ungrateful when there are so many people who don't even have a bed to lay their heads at night. I remember praying and venting to the Lord about my frustration and disappointment with the bedding situation, but the thought didn't even cross my mind to ask God to do something about it. One evening, only a few days after arriving in Houston, I came home and opened my bedroom door to find a full sized bed frame and mattress set! As my eyes settled on the beautiful new bed, my jaw literally dropped. I stood there in amazement and confusion. Where had this bed come from?! Wait, I thought, did I say something to Kristen about the cot? I couldn't remember mentioning anything to her or Rebecca, or anyone for that matter. I didn't want to complain to my hostess or seem ungrateful. It seemed as if the bed had fallen from Heaven! When Kristen returned home from work that evening, I asked her where the bed had come from. She said that one of her friends, Joe, knew she had an empty room that could use a bed. Joe's neighbor had offered him the mattress for free, so Joe decided to take it to give to Kristen! He had no idea about my situation. The Lord had heard the desires of my heart. The thought hadn't even crossed my mind to ask Him for a better bed, but God knew exactly what I needed, without me even thinking to ask for it! That night, laying in my wonderful, new bed, I was overwhelmed by the goodness of God. That He would care enough for me, for my back, to give me a bed. He didn't have to do it. I didn't even ask Him for it. But in His grace, He provided abundantly more than I could ask or imagine! Whenever I remember that story, I'm reminded of God's love for me and the simple fact that He knows and He cares. The God of the universe knows where I lay my head at night. He cares about my health. He knows my wants and desires, and He cares about my pain. He loves me deeply, and gives good gifts. He's a good Dad. Take comfort, knowing that He knows your heart's desires and He cares for you. This blog is basically an excerpt from my personal journal. As I was spending time with the Lord this morning, I realized I am believing a lot of lies about who God is, specifically within the context of raising support for our ministry. I don't usually write about support raising, because, lets be honest, talking about money can be awkward and uncomfortable. But I believe it's important to be honest and transparent, especially when you're in a position of leadership, like ministry. I don't want to put on a facade and seem like I have it all together with support raising, when the reality is I struggle daily to trust God. So with that being said- these are the lies that I'm believing right now. And the truth that I am finding hope in. I hope this will encourage other support-based missionaries and ministers. And for those of you who support us, know we are so incredibly grateful for your generous, selfless giving. You make our ministry possible. “Even after Jesus had done all these miraculous signs in their presence, they still did not believe in him." Father, that is me. That’s my struggle. You have provided SO MUCH already. SO much more than I can ask for or imagine, yet I struggle to believe that You will continue to provide. You've provided almost all of the financial support for our ministry, which is literally a miracle. We are so close to being 100% funded. Father, please forgive my unbelief. I pray that You would take the little belief that I do have and help me to multiply it. Please grow it inside me. Help me to water it with the Truth. Here are the lies I’m believing, Lord. 1. You are not enough. I need MORE. More money, more recognition, more things, more time, more sleep, more everything. 2. You are not faithful. I can’t trust You to provide. 3. There is not enough money to go around for all of the missionaries, non-profits, ministries and churches. 4. This isn’t sustainable in the long term. We can’t possibly raise even more money than this in the future to support a family and kids. 5. We are getting the short end of the stick with our salary. We could... and "should" be making triple or quadruple in the business world. 6. I’m believing that people are selfish and that You can not change people’s hearts when it comes to money. Christians are not generous and theres nothing You can do about it. Lord, help me speak the TRUTH. Let me hear it and believe it deep down in my heart of hearts. 1. You are MORE than ENOUGH. More money, things, time, sleep, clothes, love, etc… will not satisfy me. I will always want MORE. They are temporary lovers who don’t deliver on their promises. 2. You ALONE are Faithful. You are the ONLY One who will never fail me. You are King of Kings, Lord of Lords. Alpha and Omega, Beginning and the End. The author of life. The creator of all things. You fulfill all of Your promises. 3. & 4. You own EVERYTHING. It is all Yours and I am just a steward of it. Lord, help me be a faithful steward of what You’ve given me. There are no ends to Your provision, You supply every living creature with their needs. You are faithful and You will provide for John and I, plus all the other missionaries in the world. Plus, look at how many missionaries You already provide for on Cru staff alone! Their needs are being met in abundance and You have called us to the same mission as them. You are the same God, yesterday, today, & tomorrow. You won’t fail any of us. You will continue to provide for all of our needs, for the rest of our lives. 5. Ugh, the short end of the stick. Lord, this is the one I struggle with the most. Father, help me to see the eternal benefits that we are reaping. Help me to truly believe that this "sacrifice" is NOTHING compared to the glorious riches that are given to us in Heaven. Wealth and financial security are incomparable to a front row seat to You working miracles. LIVES are being transformed. People are going from death to life, experiencing joy and hope through Jesus. Most importantly, help me to know the truth that even if we were both making a million dollars, we would still be wanting more. The things of this world don’t satisfy, they always leave us wanting more. 6. Yes, people are selfish. We are all sinful and desperately in need of a Savior. Yes, Christians should be more generous than the average person. Yes, Satan does have a stronghold on Christian’s money, especially in America. BUT GOD, is able to do immeasurably more than we can ask or imagine. And NOTHING is impossible with God. If the Lord can change my heart and make me a new person, He can and will change the heart’s of believers to be generous. Plus, we have over 100 people on our support team who are incredibly generous and they are living proof that God is Lord over all areas of our lives, even our finances. Lord, help me to remember these Truths. I pray that You would write them into my heart. That whenever the lies whisper in my ears, I would be able to hear them immediately and speak truth to them. Lord, help me to pursue You relentlessly. I love You. Amen. Would you please join us in praying for the Lord to provide $650 in monthly support for our ministry? We are praying specifically for 7 people to join us at $100 a month, so we can be fully funded and begin our work on campus. Thanks for praying with us! Writing (and reading) is something I’ve always been told that I’m good at. Not only am I good at it, but I also thoroughly enjoy it as a pastime that comes easily to me and brings me joy. I just read the most interesting article about how scientists have studied how praise impacts children. The conclusion was that instead of praising your child’s natural ability or intelligence, you should praise their hard work and perseverance. The idea is that if you only praise their intelligence, they will shy away from working hard at subjects that don’t come as easily to them. One of my favorite quotes from the article really hits home for me. If I’m being honest I’d have to say that I’ve hardly ever put effort into my academics. I never had to work for good grades until I was in college, and when I did it was a real blow to my pride. I’ve always been told that I’m gifted in English and Social Studies, and according to standardized testing I’m gifted in Math and Science as well. But my grades never reflected that. I was placed in Honors Math classes until high school when math didn’t come so easily to me. In 9th grade I dropped down from the Honors to Advanced Algebra class, and after almost flunking that class, I dropped down to the Basic class in 10th grade. I’ve always wondered- how did I go from being “gifted” in Math and doing fairly well in Honors classes to struggling through a Basic level class? It just didn’t really make sense. Now I see the problem was that I believed if I wasn’t naturally good at something, I shouldn’t try it. I didn’t want to have to “put in the effort”. I was far too proud to do that. If it didn’t come easily to me, I didn’t want to do it. Which is why I quit every other sport except Track. I was naturally one of the fastest girls on the team. And I didn’t even have to work at that either, I often skipped out on our 1 mile warm up lap during practice. Why run a mile if I’m already the fastest sprinter without trying? As I’m writing this I’m embarrassed of myself. Have I ever worked hard to learn something that didn’t come easily? I took the SAT only twice, because my score was “good enough” to get into Clemson and USC. My math score was the problem and I believed there was no point in trying to increase it since I’m “not good at math”. I’ve always just settled when it comes to things that I am good at or not good at. The heart of the issue is that I’m afraid of being seen as a failure. I will do something I’m naturally good at, but I am too terrified of failing to try anything new. I don’t respond well to failure, because I never learned how to. The truth is I’m a Recovering Quitter. I quit tap, soccer, ballet, gymnastics, softball, swim team, art classes… the list goes on. The good news is I don’t quit things anymore. The bad news is now I would consider myself a “Don’t Tryer”, because I don’t even try new things anymore for fear of failure. Thankfully, my God doesn’t let me stay where I am in my sin and in my fear. My Father, being the good Dad that He is, won’t let me miss out on life because I’m afraid of failing. Recently, the Lord has convicted me of this fear in my heart. He has gently reminded me that my self worth is not in whether I fail or succeed. My identity is not in what I am gifted at or what I struggle with. My failures do not define me, but more importantly my successes do not define me either. My identity is in being the daughter of the Creator of the Universe. Psalm 139:14 says, “I am fearfully and wonderfully made” and today I’m going to choose to believe that. I’m going to put my trust in God, as He molds my heart to make me more like Jesus. I’m going to rest in the knowledge that I don’t have to be perfect. It’s okay to try and fail- as long as you try. God doesn’t want us to be a slave to success. He doesn’t want us to feel like we have worth only when we succeed. He wants us to live in freedom and enjoy this beautiful life He’s given us. So, in light of these recent convictions and soul searching, this past month I’ve tried something new. As ridiculous as it sounds, I realized I was avoiding learning to cook, because I was afraid I would be bad at it. So my poor husband, John, has lived the first four months of marriage eating nothing but pizza, pasta, and sandwiches. The past two weeks I’ve made 7 new recipes, and I’m happy to report that they weren’t half bad! I still have a long way to go… I had to call my mom like 50 times to ask questions like “What is a parsnip?” and “How do you mince garlic?” and “What does it mean to simmer?” But I’m learning and taking a chance by trying something new. Next up on my list of “new things to learn” is tennis! What’s something that you’ve always wanted to learn, but have been afraid to try? If you want to read the article that inspired this post click here to go to the NY Magazine article.